Looked at as a prized delicacy, asparagus has been around and used since ancient times by the Greeks and Romans. Asparagus is one of the oldest recorded vegetables, and it is thought to have originated along the coastal regions of eastern Mediterranean and Asia Minor areas. Asparagus is a member of the Lily family. Its spears grow from a crown that is planted about a foot deep in sandy soils. When grown under ideal conditions, an asparagus spear can grow 10″ in a twenty four hour period. Each crown will send spears up for about 6-7 weeks during the spring and early summer. Nutritionally, asparagus is full of benefits as it is a nutrient-dense food which is high in folic acid. A 5.3 ounce serving provides 60% of the recommended daily allowance for folacin which is necessary for blood cell formation, growth, and prevention of liver disease. Asparagus is also a good source of potassium, fiber, vitamin B6, vitamins A and C, and thiamin. Asparagus contains no fat, no cholesterol and is low in sodium. Asparagus is good in minerals, especially copper and iron. In addition, it has small amounts of some other essential minerals and electrolytes such as calcium, potassium, manganese, and phosphorus. Potassium is an important component of cell and body fluids that helps controlling heart rate and blood pressure by countering effects of sodium. Manganese is used by the body as a co-factor for the antioxidant enzyme, superoxide dismutase. Copper is required in the production of red blood cells. And iron is required for cellular respiration and red blood cell formation. Cut spears diagonally in 1/2 inch pieces, leaving tips whole. Stir-fry pieces in butter or hot oil, in a skillet or wok at medium high heat. Stir constantly until tender-crisp, 3 to 5 minutes. Microwave fresh asparagus by placing one pound in a microwavable baking dish or serving bowl. If cooking whole spears, arrange with tips in center. Add about 1/4 cup water and cover tightly. Microwave at 100% power for 4 to 7 minutes for spears, 3 to 5 minutes for cuts and tips. Stir or turn halfway through cooking time. Microwave frozen asparagus in a covered microwavable baking dish with 2 Tablespoons of water. Cook at 100% power for 4 to 7 minutes, stirring or rearranging once. Drain all but 1 Tablespoon of liquid, and microwave at 100% power for 2 to 4 minutes, stirring once halfway through cooking time. 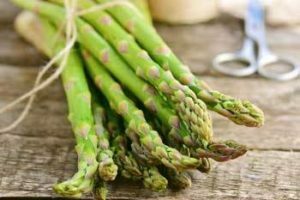 Asparagus spears can be enjoyed raw, steamed, broiled, and eaten in salads, in pasta, in omelets, in soups, as a frittata, in casseroles, grilled, sautéed, stir-fried or mixed with vegetables, beans, poultry or seafood. Steamed spears are served with citrus hollandaise sauce, melted butter, parmesan or pecorino cheese great ideas from French style recipes. Add some dill sauce on top of steamed asparagus or sprinkle nuts on top like pistachios for a fun flavor. Grilled onions and asparagus stalks smeared with macadamia nut oil is a wonderful appetizer.